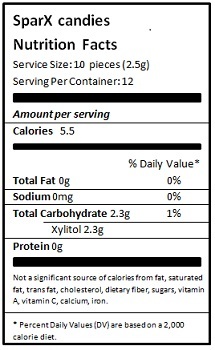 SparX Xylitol Candy are naturally flavored little candy "dots" that are rich in Xylitol. Kids love the great taste while parents can feel confident that they are giving their kids a treat which actually helps improve dental health. SparX candies are just what moms and all health conscious people have been craving - sweetened with 100% xylitol, they're tasty treats that don't promote tooth decay.